A Bit of Sass: Recap: NYC, Lucky FABB and Chicago! 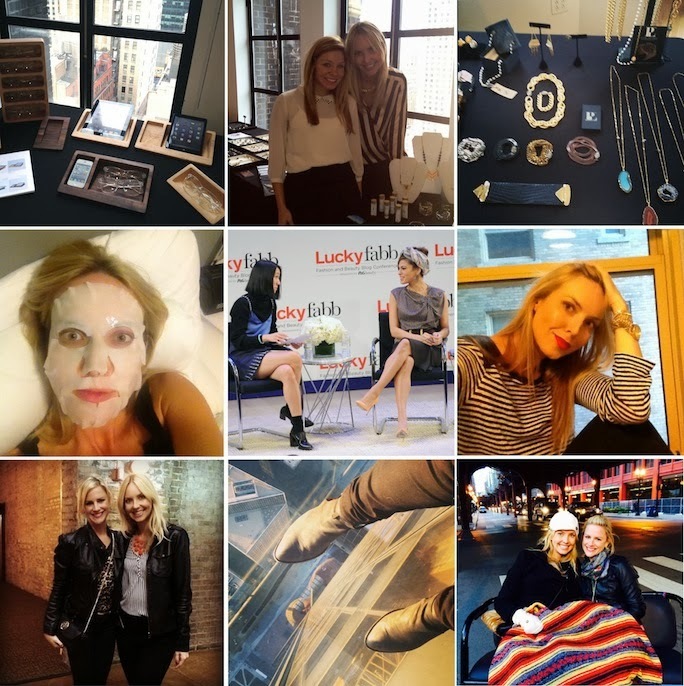 Recap: NYC, Lucky FABB and Chicago! First, I headed to New York to assist in hosting a press preview for the pr company I work for. There we showcased clients' new lines and collections for magazine and online editors. I shouldn't play favorites, but I'm kind of obsessed with the new jewelry line Porter Lyons. The Louisiana based and inspired brand combines natural elements such as alligator bones with luxe metals - resulting in a unique feel. All the editors went crazy for the line - check it out here. Thursday I headed to Lucky FABB, which was a great event, but I have mixed emotions on what I came away with (*note: I only attended Thursday). Pros: I got to meet a couple lovely fellow bloggers I've known online including Ashley of SideSmile Style and Jess of Jess Styles Rules and also met the adorable Misse of Honeybee Weddings- who I snuck away at lunch with to hit up a YSL sample sale (no luck though). The speakers were also very interesting and Eva Mendez was totally endearing- her scarf trick was a fun highlight. Cons: The conference was understandably geared towards the (inspiring) professional blogger, which I am not. It really emphasized how in order to be successful you needed to spend lots of time on all your social media channels ect. As someone with a full time job, I just don't have that sort of time to commit to my blog. Although I love the creative outlet blogging gives me, Lucky FABB made me want to take a step back and focus on the reality which pays my bills. Friday after morning meetings and an hour of power shopping, I flew to Chicago to visit a girlfriend I hadn't seen in way to long. We hit the town, drank wine, gossiped, watched movies, spent hours in the line before getting 20 seconds on a plexiglass overlook 103 floors up at the Willis Tower, and in general had a blast. A girls weekend was exactly what I needed to end a busy and at times discouraging trip. Style wise I have a bit of a disclaimer: as you can see, I'm pretty into black & white stripes at the moment. My goal for this trip was to only take a carry on and I'm proud to say, I was successful! I managed to accomplish that by keeping a monochrome/neutral palette which I jazzed up with accessories. Key items for me were: silk trousers, striped top, leather sleeve blazer, a statement watch, and slick black pumps. It was so fun to meet you! I am sorry that we didn't get a chance to hang out more. The second day was more informative and had the best swag bag to date!